In a conversation with Lee White, Park Ranger at CCNMP, the other day, I asked him what he thought of Tom Crittenden. We chatted about his overall reputation – not a good one, usually – and agreed that it seems to be built on vague impression more than substantive instances of blunder. 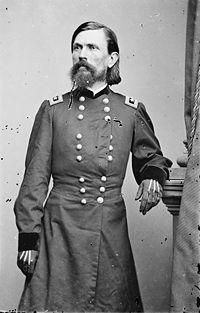 Despite playing a prominent role in the first two years of the war, rising to a senior command in the Army of the Cumberland, and an extensive post-war career in uniform, Major General Thomas L. Crittenden has left a surprisingly small footprint on the pages of Civil War history. Or perhaps it’s not so surprising, considering that he was essentially sidelined by the end of the war, and played little role in the final year so crowned with Federal triumphs. The record that does exist is largely negative. Most historians dismiss him casually, and he is widely regarded as incompetent – just another of those “political generals” that had to be weeded out of the ranks before the business of winning the war could be addressed. A closer look, however, leaves me scratching my head: There are few details (with one glaring exception – more on that later) usually provided by which we can pass our own judgment on Crittenden. Thomas L. Crittenden was born in 1819, into yet another of those prominent Kentucky families that seem to dominate Civil War history. His father was John J. Crittenden, long time Senator from the Bluegrass state, and most famous for his efforts to forge the “Crittenden Compromise ” in the winter of 1860-61 in an effort to stave off secession. Tom studied law with his father, passed the bar in 1840, and set up his own practice in Kentucky. His only military experience came in the Mexican War. He gained a commission as a Lieutenant Colonel, recruited Kentuckians for the war, and served as an aide to General Zachary Taylor. His actual command experience seems to have been limited, as was his exposure to combat. He did not remain long in uniform, returning to the law and to business in 1848. He declined to take up his father’s profession and run for office, confiding to a friend that Washington DC was “too dissipated” for him. Apparently Tom liked to drink – a lot – and feared that the social whirl of Washington would lead him down a dangerous path. He was an ardent Unionist, however, and a foe of slavery. When war came, he was an obvious choice for high Federal rank, given how vital the Lincoln government viewed the importance of Kentucky. In July, 1861, Crittenden was appointed a Brigadier General, USV. He commanded camps of pro-Union militia, a counter-weight to the pro-Confederate State Guard being recruited by secessionist-minded Kentuckians. One of the latter was George B. Crittenden, Tom’s older brother, whose sympathies lay with the south. Unlike Tom, George was the martial one, having graduated from West Point in 1832, spent some time as a private adventurer, only to return to the army in time for the Mexican War. George also shared a taste for strong drink, however, so much so that it got him tossed out of Confederate service for drunkenness in 1862. Tom might have a reputation as a drinker and a man who knew his way around a curse, but he also proved to be a competent soldier. He successfully commanded a division at Shiloh, and around Corinth. When Confederate General Braxton Bragg invaded Kentucky, Crittenden’s command was with that part of Buell’s army sent back to oppose the invasion, and by the battle of Perryville, Crittenden was one of three corps commanders in the army. Except for some skirmishing with cavalry, Crittenden’s Corps saw no action at Perryville, however. They made up for it at Stones River. Crittenden’s command, soon to be re-named the XXI Corps, was tasked with striking Rosecrans’ main blow on December 31st, crossing the river to attack Bragg’s right flank while fellow Union General Alexander McCook stood off Bragg’s own attack on Rosecrans’ right. Things didn’t go as planned. Bragg hit first and harder than expected. McCook’s wing crumpled, and Crittenden’s men had to re-cross the river to come save the army. The Union forces hung on, though just barely, and after some time to ponder – and one more doomed attack by the Rebels on January 2nd – Bragg retreated from the field, leaving Rosecrans to claim a victory. Crittenden has been criticized for being too slow on the approach to Perryville, and for not doing anything during the actual battle of Perryville; as well as being dilatory in starting his attack at Stones River. Neither attack really hits the mark. At Perryville, George H. Thomas was really in command, and made the critical decisions regarding Crittenden’s column. Thomas had the nebulous post of Second in Command to Buell at the time, and accompanied Crittenden on his march to the field. Thomas made the critical decision to halt and rest the men that made Crittenden’s corps a day late to the field, and as for not attacking on October 8th, that was per Buell’s express orders. At Stones River, Rosecrans actually wanted Bragg to attack, hoping to draw Rebels into a fight against McCook so they could not disengage quickly once Crittenden began his own attack. What no Federal anticipated was how unprepared McCook’s men would be for this attack, or how quickly the Union right would crumple once struck. The collapse of McCook’s line threw Rosecrans’ plans into disorder, and in fact Crittenden earned Rosecrans’ respect and trust by hustling his men back across the river to shore up the Union defenses when needed. Of course, George Thomas played a critical role here as well, solidifying his own relationship with Rosecrans, but the point is that Crittenden responded well when called upon. The XXI corps was given the same assignment during Tullahoma. Crittenden would spearhead the flank march designed to get around Bragg’s right and disrupt his supply line while McCook and the Cavalry drew Bragg’s attention to the Rebel left. While that campaign ended without a battle, Rosecrans was satisfied both with the outcome and again with Crittenden’s performance. Chickamauga, of course, was a major turning point in Crittenden’s career. His is famously portrayed as a fool by several officers for not believing that Bragg’s army had been reinforced or that Bragg was crossing the Chickamauga on September 18th. Peter Cozzens, for one, has picked up on that and played it up in his own narrative of the battle, This Terrible Sound. However, the main sources for that portrayal comes from John T. Wilder’s and Robert H. G. Minty’s brigades – especially Wilder and Minty themselves. These two officers played a valiant role in slowing Bragg’s advance on September 18th, but they also knew that and dramatized their impact to burnish their own reputations after the war. In order to “save” the Union army from disaster on the 18th, Wilder and Minty had to “discover” that which no one else knew – Bragg had been reinforced and was on the move. In fact, there is other evidence that suggests that Rosecrans, Crittenden, and Thomas had a fairly sound grasp of what Bragg was up to. On September 19th, Crittenden was active and involved in the fighting from about midday on. He sent reinforcements to Thomas promptly when asked, and moved his corps up into the fight as soon as he could, given the need to guard the crossing at Lee and Gordon’s Mills. Crittenden played a significant role in the fighting at Viniard field, though not always with success. Federal units kept entering the fight at almost random intervals, creating a great deal of chaos. In addition to Crittenden, three Union Divisional commanders from two different corps tried to orchestrate events as well, which produced the opposite effect. Crittenden might have done better to wait, co-ordinate a better organized advance, and then commit all these forces at once rather than by brigade. Even Cozzens, however, acknowledges that Crittenden turned in one of his better performances as a corps commander on September 19th. September 20th essentially ruined Crittenden’s wartime career. After the fighting on the 19th, Rosecrans pulled Crittenden and two of his divisions (a third was assigned to Thomas) back into a reserve position. Throughout the morning, Rosecrans dispatched those two divisions to other parts of the line and to other commanders, until by 11 AM Crittenden had no command left, and asked Rosecrans to allow him to accompany his last brigade into action. That was the moment, of course, when Longstreet’s Confederates smashed through the gap at Brotherton Field. Caught up in this fight, Crittenden tried to rally some stragglers from his command and support an line of batteries placed by Major John Mendenhall, his chief of artillery. Attacked by four Rebel brigades, this effort failed, with the loss of 14 Union cannon. Crittenden and his staff retreated up the Dry Valley Road towards Rossville. Along the way, Crittenden came across Colonel Parkhurst and his 9th Michigan, (provost guard for the XIV Corps) who were rallying stragglers. Parkhurst, seeing a Major General arrive, offered the scratched-together command to Crittenden. He declined, and rode on, passing through Rossville to arrive in Chattanooga that afternoon. Eventually Rossville became a rallying point for four divisions – Wood, Davis, Negley and Sheridan – as well as fragments of other commands. Most of them arrived after Crittenden passed through. Had the corps commander halted at Rossville, almost certainly his subsequent career in the Army of the Cumberland would have been much different. He didn’t stop, however, and was relieved of command. For months, Crittenden sought a court of inquiry to clear his name, as did many of his supporters back home in Kentucky. Eventually that board met in February 1864, and cleared Crittenden of any wrongdoing. His career, however, remained sidetracked. Interestingly enough, he was to hold one more command. On May 11th, 1863, Crittenden was assigned to command a division in the IX Corps, under Ambrose Burnside, replacing Brigadier General Thomas G. Stevenson, who was killed the previous day. Crittenden was by then one of the senior Major Generals in the army, his date of rank superseding even Meade’s, but not Burnside’s. This amounted to a considerable demotion in responsibility if not in rank, but Crittenden served for the duration of the fall campaign, finally resigning in December 1864. His service under Burnside garners very little notice among historians of the Overland Campaign. As a coda to his wartime service, Crittenden re-entered the army in 1866, and served until retirement in 1881. To me, Crittenden seems ill-served by history. Yes, he was a political general, and made mistakes. Of course, the difference in experience between civilians and professionals was much narrower in 1861, and plenty of West Pointers committed blunders as well. Many political generals, however, turned out to be competent at their jobs, and most felt the often barely concealed disdain the West Pointers felt towards their ilk. His one great failing was in not stopping in Rossville on September 20th, to assume command of the force that eventually collected there. Of course, William Starke Rosecrans also committed the same blunder. It cost them both a great deal. Here is the announcement for the details of the 2011 CCNMP Study Group seminar. Please feel free to share it, post it, or pass it on to any who might be interested. CCNMP Study Group 2011 Seminar in the Woods. Please also note that this fee is NON-REFUNDABLE after February 1st, 2011. Once we are committed to the bus, we will be charged the booking fee.